Appeared to be chased by security after running onto the pitch at the final whistle. 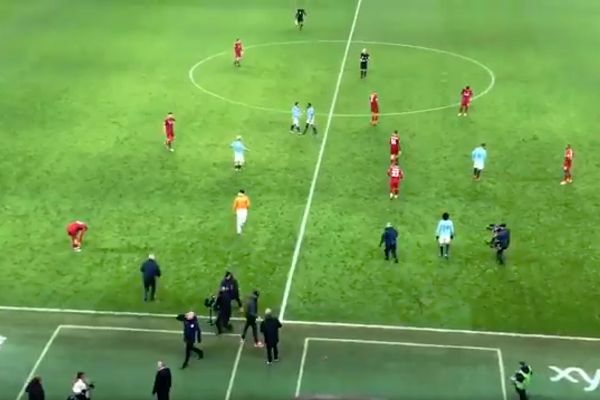 Injured Manchester City defender Benjamin Mendy appeared to be mistaken for a pitch invader after the club’s 2-1 win over Liverpool on Thursday night. There were celebrations at the Etihad Stadium after Pep Guardiola’s side clinched a crucial three points that could prove to be a turning point in the title race this season. Mendy, who has been unavailable for selection since November, ran onto the pitch at the final whistle wearing all white along with a bright orange jacket and a hat. Apparently confusing the player with a pitch invader, a pair of the ground’s security team break into a sprint in hot pursuit. The stewards seem to realise what’s going on when they reach him, already embracing his Man City teammates. The duo quickly save face by moving on to greet the departing officials.